David Boys won the 1995 World Scrabble Championships in London representing Canada. A 5-time Canadian WSC participant, he works as a programmer/analyst in Montreal. Alfred Mosher Butts invented the game that would become Scrabble in 1931. An unemployed architect at the time, he toiled for many years before discovering the magic formula that would sell over 100 million sets worldwide. He studied the letter frequency from the New York Times’ front page to determine Scrabble’s letter distribution. Oddly enough, he was not especially good at Scrabble. Butts was widely revered by Scrabble players around the globe at the time of his death 1993. Brian Cappelletto is an options trader in Chicago and perennial favorite in any Scrabble tournament that he enters. The first child Scrabble prodigy, he finished in second place at the 1991 World Scrabble Championships. Known for his extraordinary word knowledge (and spot-on impersonations), he is a fierce competitor who won the 1998 National Scrabble Championships in his hometown. He is fond of using his Scrabble skills to win bar bets. James Cherry is one of the many smart computer guys who seem to be everywhere at the World Scrabble Championships. Twice he competed for Canada at the WSC and has created a very slick Scrabble computer program that none of us reg’lar folks could even dream of beating. Chris Cree is known for occasionally cracking up a roomful of Scrabble players with his good-natured complaining when he pulls bad tiles. A solid Texan, Cree dabbles in real estate and works in the wholesale forklift business. Incredibly, he won $256,000 gambling in Las Vegas during breaks from the 1995 Scrabble Superstars Showdown. When asked which he would have rather won, the $256K gambling or the $50K Scrabble Grand Prize, he replied that he wanted the glory that only a Scrabble championship could bring. Joe Edley is the only 3-time winner of the National Scrabble Championships (no one else has won it more than once). Often seen practicing tai-chi or meditating in between games, Edley is the Zen Scrabble Master. He doubles as the National Scrabble Association’s Director of Clubs and Tournaments and co-authored (with NSA Executive Director John D. Williams, Jr.) the seminal book on Scrabble strategy and tips Everything Scrabble. Paul Epstein is a former musician/cab driver from Ann Arbor, Michigan. He is currently studying for his Masters in Social Work at the University of Michigan. A regular on the Scrabble circuit for many years, Epstein gave “GI” Joel Sherman his nickname and finished 5th at the 2002 National Scrabble Championships in San Diego. Stefan Fatsis writes for the Wall Street Journal and is a correspondent for National Public Radio. His humorous and insightful book Word Freak details the Scrabble subculture and his multi-year climb from novice to expert Scrabble player. Robert Felt, a six-time Team USA member at the World Scrabble Championships, won the 1990 National Scrabble Championship. Known for his extraordinary word knowledge and encyclopedic knowledge of past games, Felt was always a formidable opponent. He passed away in December of 2002. He is missed. Marty Gabriel is a Scrabble expert and social worker for the Chicago Public Schools. Among his Scrabble achievements are several games in which he has scored in excess of 700 points. Gabriel takes pleasure by intimidating opponents by drinking vinegar straight from the bottle during games. 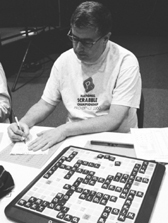 Jim Geary Scrabble resume includes a 6th place finish at the 1998 National Scrabble Championships and thrice representing the United States at the World Scrabble Championships. Geary gambles professionally for a living and is quick to crack wise. Matt Graham is a stand-up comedian comedy writer in New York City. He has worked for Saturday Night Live and has done several stints on Late Night with Conan O’Brien. His creative wordplay and expert timing makes his comedy a refreshing alternative to most comedians on television today. An uncompromising competitor, Graham loves to shoot hoops and play Scrabble for extra cash. He finished second in the 1997 World Scrabble Championships. Jim Kramer is one of the few Scrabble experts who earns a living with words. A true gentleman, Kramer is a proofreader in Minnesota and finished third in the 2001 World Scrabble Championships. Mark “Mr. 770” Landsberg, a retired game inventor from Orange County, California, is best known in the Scrabble world for scoring a record 770 points in a tournament game in 1993. His intrepid friend Alan Stern (best-known as the “King of the One-Liners) served as his unknowing victim. Their combined 1108 points is still a record (as is Landsberg’s 770). Ben Loiterstein cable access show, Scrabble TV, ruled the Boston-area airwaves from 1998-2001. He is an educator and once played 12 simultaneous games of Scrabble. Robin Pollock Daniel has represented Team Canada at the World Scrabble Championships four times. Exceedingly funny and trained as a psychologist, Daniel raises two children with her husband in Toronto. Lester Schonbrun played Scrabble at the legendary Flea House in New York City in the 1960s when folks such as chess champion Walter Browne, Stanley Kubrick and Peter Falk frequented the joint. Extremely well-liked and respected by his Scrabble peers, Schonbrun is a legal secretary in Oakland by day and an avowed communist. “GI” Joel Sherman is perhaps the world’s only professional Scrabble player. He won the 1997 World Scrabble Championship in Washington, D.C. and the 2002 National Scrabble Championship in San Diego. Legendary for his physical ailments, Sherman is the poster-boy for making lemonade out of lemons by achieving Scrabble greatness after his many illnesses forced his retirement from bank-telling. Allan Simmons is a Scrabble consultant from Scotland. He is the brains behind the UK-based Scrabble newsletter ONWORDS and has played in the WSC twice. Charnwit Sukhumrattanaporn is one of the many players from Thailand who can throw down tiles with the best of them - American, Canadian, British or other. Charnwit, a student who plays Scrabbleto help learn English, finished second at the prestigious 2001 United States West Coast Championships. Often referred to as "Mister Scrabble" by word game enthusiasts, the media and the manufacturer of the game, John D. Williams, Jr. has been head of the10,000 member National SCRABBLE Association since 1987. Mr. Williams is also a tournament player and co-author of "EVERYTHING SCRABBLE" (Simon & Shuster), considered the definitive book on the world's favorite word game. During his tenure, Williams helped organize the first World Scrabble Championship, doubled the Scrabble tournament scene in North America and spearheaded the National School SCRABBLE Program, now used as a learning tool in nearly 20,000 schools across the country. He is a frequent lecturer on words and language. Williams also works as a writer/producer for televison and film, having worked for MTV Networks, Nickelodeon, TV Land, Paramount and others.